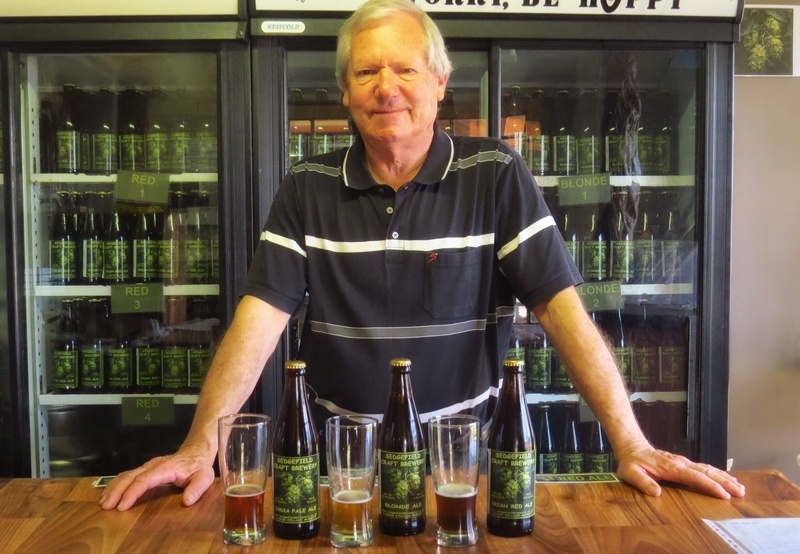 When I first met Tony Hunter he had a vision, and his vision was to start up a craft beer brewery in Sedgefield and to share his love for beer making with everyone that crossed his path. Tony loves what he does, and he loves it even more if you sit and sip on one of his beers while he chats away about the making of his beer. This is a true craft brewer and everything he does is a process of affection to his beer. It might be a small brewery, but he is a tentative brewer and a large amount of his time is being spent monitoring the steps of turning barley into a golden liquid that is not only drinkable but truly enjoyable. Going through the explanation of the process it occurred to me that even though this is the making of craft beer you definitely have to be an Engineer, Chemist, Chief cook and bottle washer and even an Alchemist. 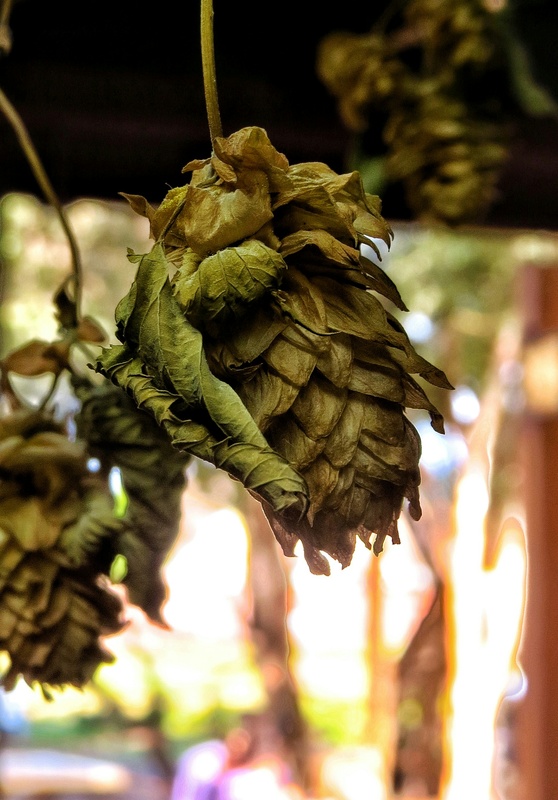 A delicate process of turning barley and hops into the nectar of the gods. The golden brew goes from one large container to the next until it settles in a holding tank where the beer is watched for a few days prior to its final dispensing into glass bottles. The end result is a line of beautifully proportioned bottles in an ice cold fridge patiently waiting to be drunk. Currently Tony has 3 types of beers that he makes. – First a light Golden Ale called a blonde that is crisp, an easy light hearted drinking beer, with a high popularity among the fairer species like me. 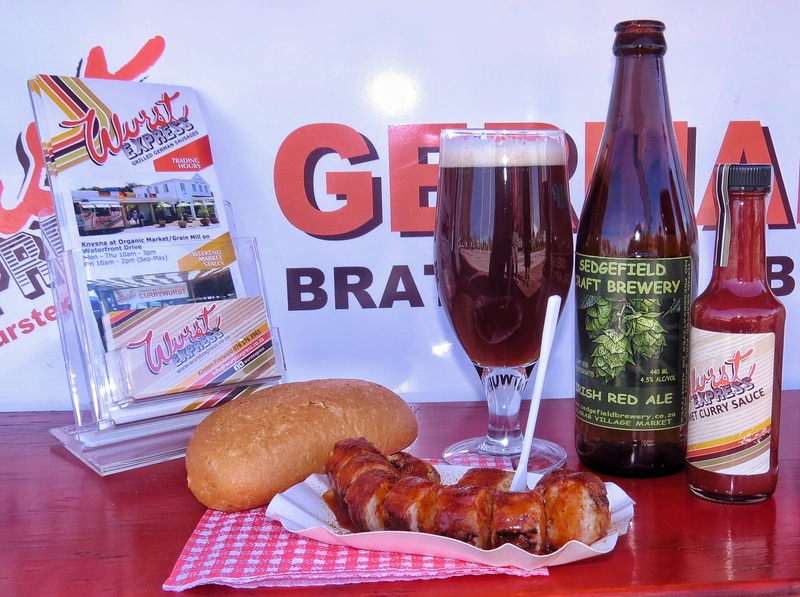 – Then the Red Ale with an interesting taste and even more interesting after taste. This beer fascinated me the most, as I experienced the taste in my mouth it felt almost like it needed a sweet pairing. – Finally the I P A, different to a few others that I have tasted, a heavy, a more bitter beer with a highly rich component; it reminds me of a deep arm chair in front of a fireplace kind of beer. My pairing of the beers had to be thought through carefully as all of these beers are sold over the counter and not available in restaurants. So my decision was to pair it with the best take out /small cafe style food that are locally found in and around Sedgefield. I had an extensive chat to Tony about pairings and I think we got this one spot on. For my second pairing I made my way to Mr Kaai in Sedgefield and for those of you who know Sedgefield’s Mr Kaai will agree that this is the best fish spot in the Garden Route. People literally flock here during season and if you want to get an order in, best you come early. 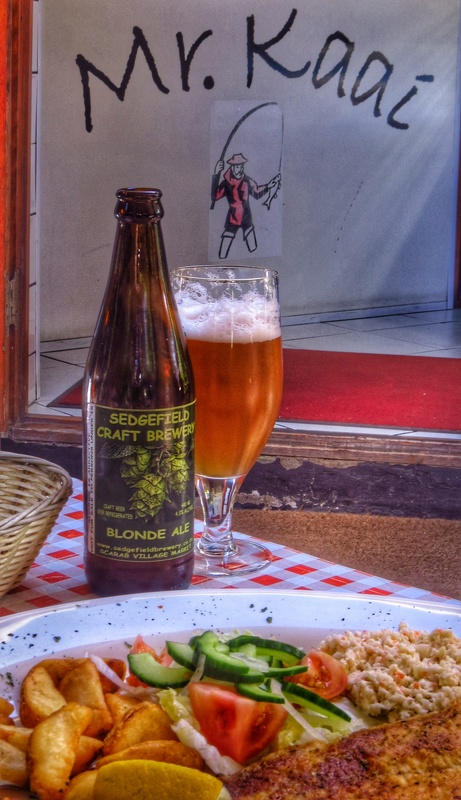 The order of the day, grilled fish and chips served with a side salad and cold blonde ale. Every mouth full was a delightful treat, the fish cook to perfection and lightness of the beer made it a great light lunch. Do yourselves a favour and head down to Mr Kaai with a couple of local beers in hand for a great experience. I P A, my last beer in need of a pairing. Just before sunset I had my beer chilled and I heated up the Pie added some chips, gravy and broccoli side salad topped with feta and cranberries for sweetness. I sat outside and over looked the ocean with my plate of food and beer in hand. This is definitely a beer for venison whether you’re eating biltong or a stew,the bitterness of beer cuts through the meat taste,nd if your pallet requires it I would add in a few raisins or other types of berries for a bit of sweetness. A rich dark beer and I agree with my previous statement of a comfy arm chair in front of a fire place. 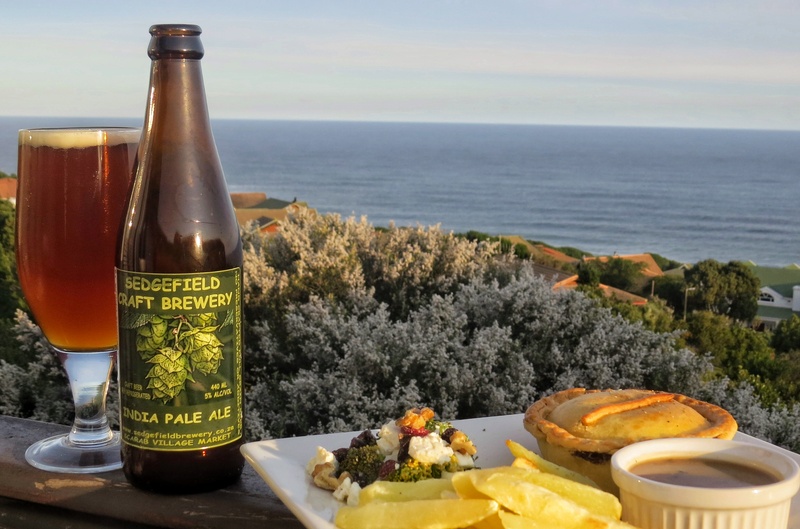 Sedgefield Brewery truly impressed me and I am delighted to say it is an overall winner. There is something for everyone to enjoy. Thank you Tony for showing me your world of beer, it is definitely highly recommended. Great find Rose, great beer form someone who is passionate about what he does.